Cyberhorse Virtual Equestrian | Cyberhorse Virtual Equestrian - WEG - Eventing - It REALLY isn't our Year! 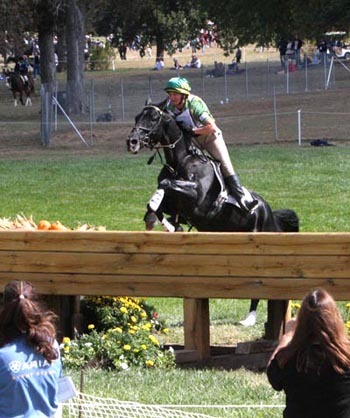 WEG - Eventing - It REALLY isn't our Year! More bad luck for the Aussies when Sonja Johnson and Ringwould Jaguar didn't appear for the trot up following their cross country phase. The Registered Australian Stockhorse 'Jag' was originally trained by Sonja to round up cows on her property back home in Western Australia. It was during this that she discovered his talent for jumping fallen logs and his slight fear of - cows and so Jag had a career change and has taken to eventing like a "duck to water"! Sonja reports that 'Bear and Pottsy the team vets were amazing'. Jag has undergone two operations in under twelve hours to flush the joint and ihe s expected to make a full recovery - phew! Our thoughts are with you Sonja. We have also heard that the injury sustained by Inonothing is a fractured patella, and he is also expected to make a full recovery. While not our year in terms of medals, we have certainly been lucky in that the illness and injuries that have befallen our team horses will not have long term effects. In true Aussie spirit We'll be back to fight again in 2012 and again in 2014! We should add that Stuart Tinney and Vettori had a clear round in the showjumping as did Peter Atkins and the green HJ Hampton. Peter and 'Henry' finished well up in the jumping and climbed nearly 30 places to finish a very creditable 24th. Great things can be expected of this pair in the future. Stuart ended up 8th in the individual rankings - a great result! Chris Burton also did a creditable round with 9 jumping penalties and some time penalties.